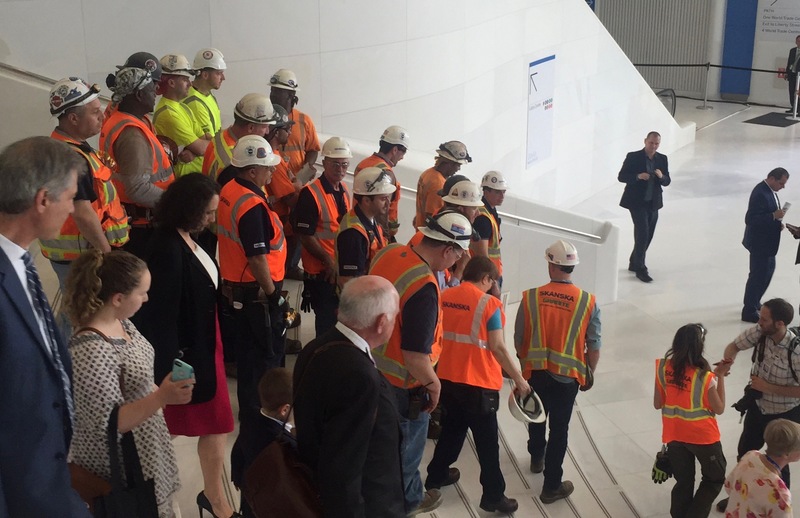 A few weeks before the opening of the new World Trade Center Transportation Hub, PATH invited journalists and members of the PATH Riders Council for a behind-the-scenes tour. 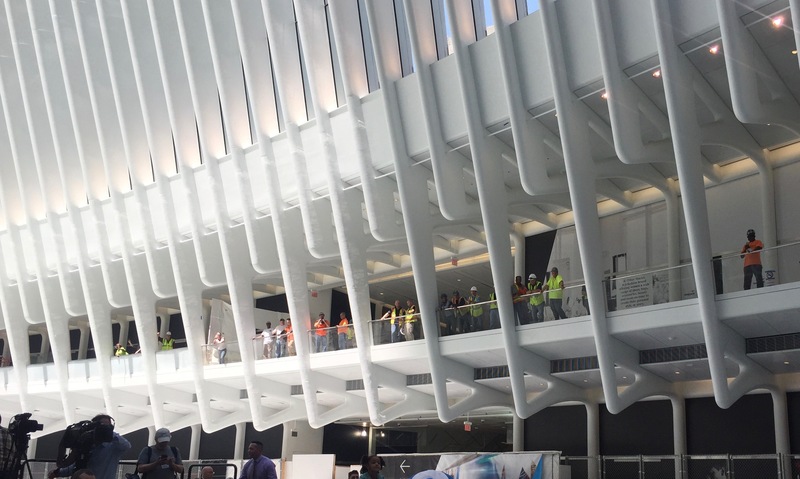 The new Transportation Hub is the fourth station to occupy the site. The first, built in 1909 as the Hudson & Manhattan Railroad’s Hudson Terminal, was replaced by a new station in 1971 under the original World Trade Center twin towers. After that station was destroyed on September 11, 2001, a temporary station opened in 2003. 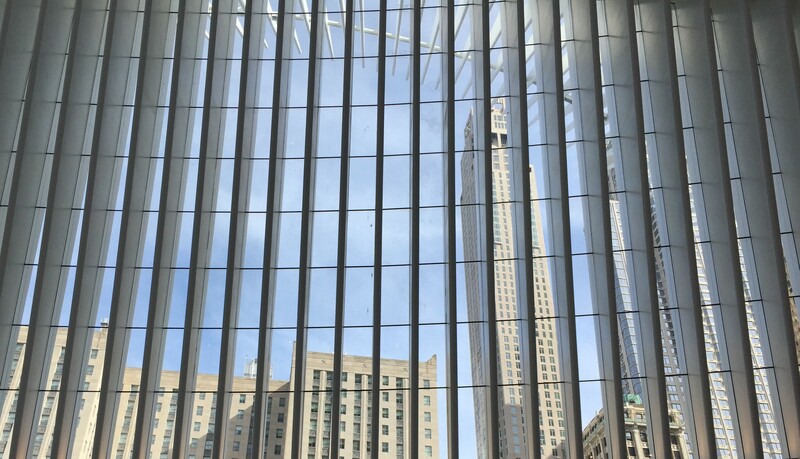 In October 2013, the West Concourse – the first portion of the new Hub – opened, connecting the Transportation Hub and Brookfield Place (formerly known as the World Financial Center). Platform A opened to regular PATH service in February 2014, followed by Platform B in May 2015. 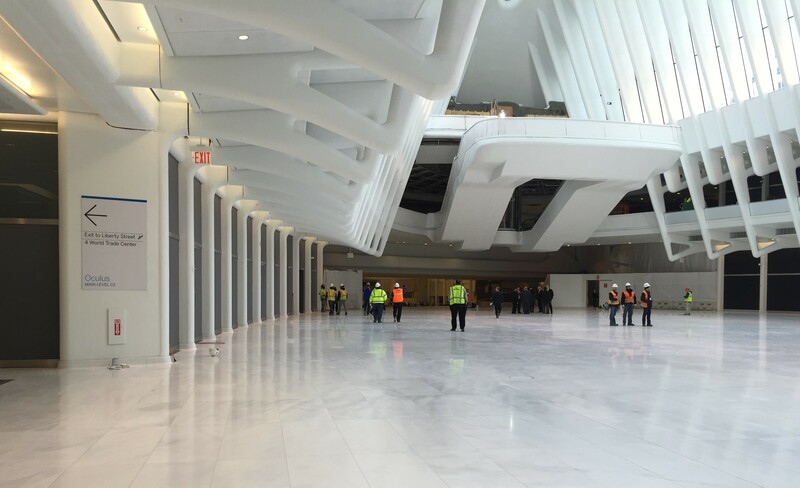 When the Oculus, the Transportation Hub’s most visible above-ground element, opened in March 2016, it connected the PATH platforms with new entrances at 4 World Trade Center, and allowed construction crews to prepare for closure and demolition of the temporary entrance at Greenwich and Vesey Streets (a permanent entrance to the transportation hub at Vesey Street will replace the temporary head house). 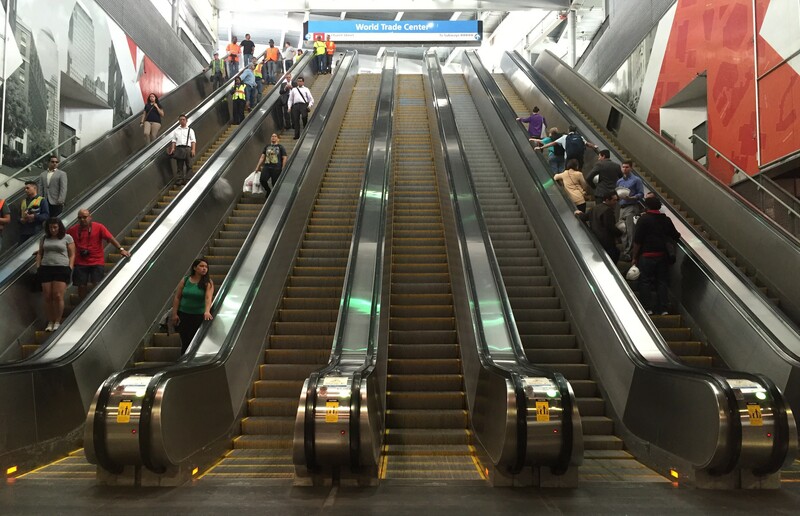 Following the closure of the temporary station, the West Concourse fully opened on June 27. 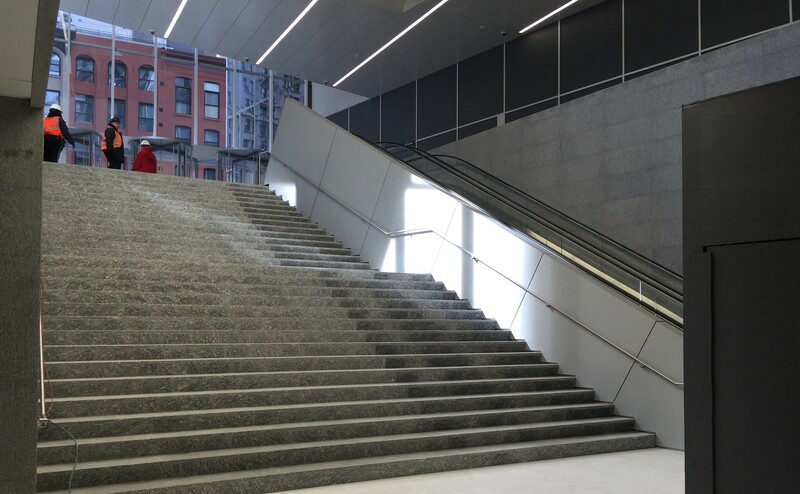 A segment of that concourse opened two years ago, connecting Brookfield Place with the temporary PATH station, and the full opening of the concourse completes the connection spanning Brookfield Place, 1 WTC, the Transportation Hub, and the NYC Subway at Fulton Center. The temporary station was the third to occupy the site. Every major architecture and engineering project in New York receives its share of criticism. The Hub, however, has become the subject of a competition among New York critics to outdo each other with ever more outlandish comparisons. The hub has been decried by architecture critics as a “kitsch stegosaurus” and “a magnificent boondoggle” (in fact, no on can resist taking a swipe—David Dunlap, in this most recent article, describes it as looking “like a turkey skeleton after it’s been stripped clean at Thanksgiving”) but soon the public will be able to judge for itself, from the inside. 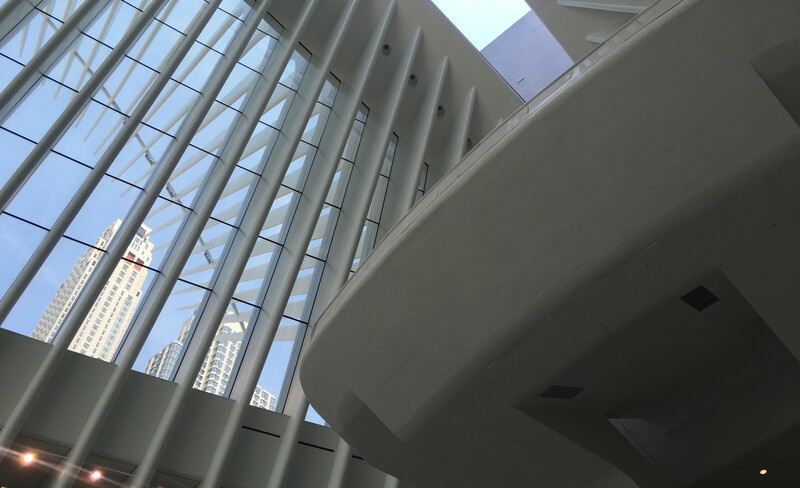 From the main floor of the Oculus, about 85 feet below ground, the view of the surrounding cityscape is unusually dramatic, and captures the momentum of renewal taking hold throughout lower Manhattan. 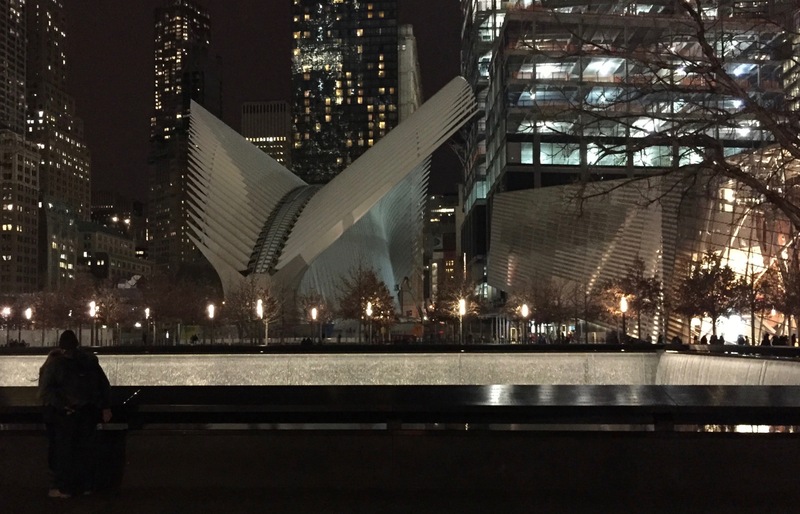 In a place that bears a nearly unmatched complexity of history, tragedy, and meaning, even for New York, the Hub and the Memorial are the two spaces that most completely belong to the public. 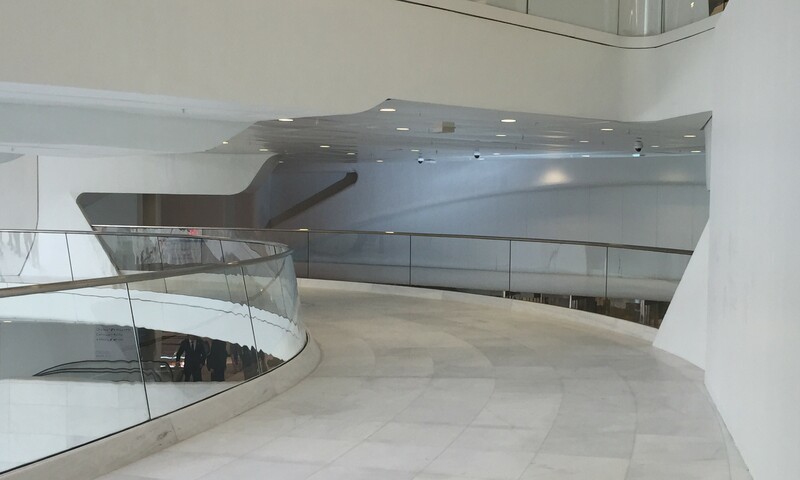 Where the Memorial signifies reflection and remembrance, the Hub’s role as a destination for transportation, commerce, and civic life represents the beating heart of Downtown. 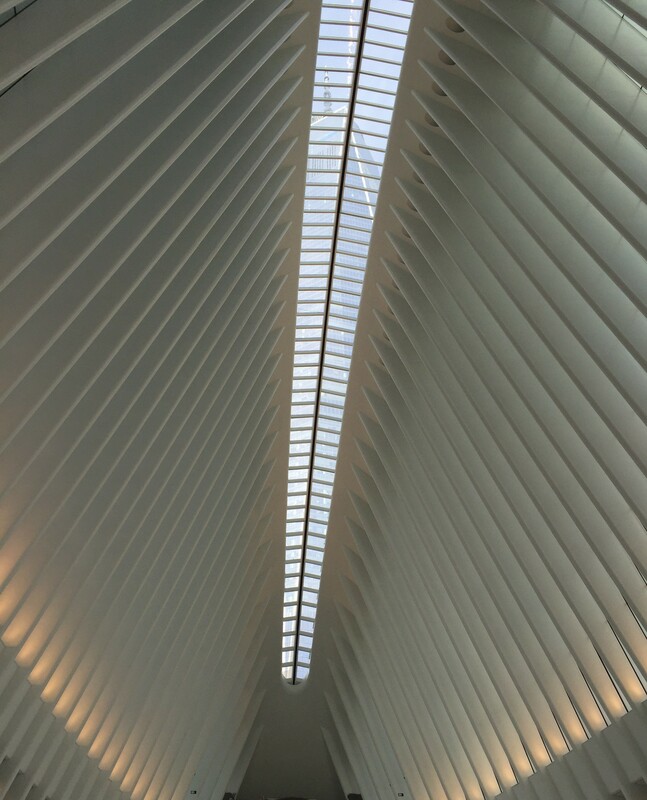 The Port Authority’s World Trade Center Construction website notes that the main floor of the Oculus is 365 feet long, 90 feet longer than the main concourse of Grand Central Terminal. What those numbers can’t convey is the airy, cathedral-like atmosphere, with so much natural light that it feels unlike any other indoor space in the city. One can easily imagine a fashion show, food tasting, or holiday train show taking place on the main floor. During Spring/Summer 2016 New York Fashion Week in September 2015, fashion house DKNY staged what may be the hub’s first major event: a runway show in the West Concourse. New York Post writer Steve Cuozzo, an often outspoken critic of the politics surrounding rebuilding the WTC site, notably softened his tone after seeing the reaction of close friends, and even conceded that critics–himself included–haven’t allowed themselves to appreciate the structures on their own merits. It might take years for New Yorkers to fully embrace it, but the rest of the world isn’t waiting. Close friends who were my next-door Manhattan neighbors until they moved to Florida a few years ago recently set me straight. He means the Hub, which I’d ridiculed as the “Calatrasaurus.” And he was correct. Most of us fortunate to have a media voice liked some elements of the WTC project but not others. If public taste is any indication, we were all wrong about the ones we hated. So let’s just stand back and admire the thing—a huge, white Venus flytrap that I find especially endearing when I happen to catch a glimpse of it from way up Church Street and Greenwich Street. 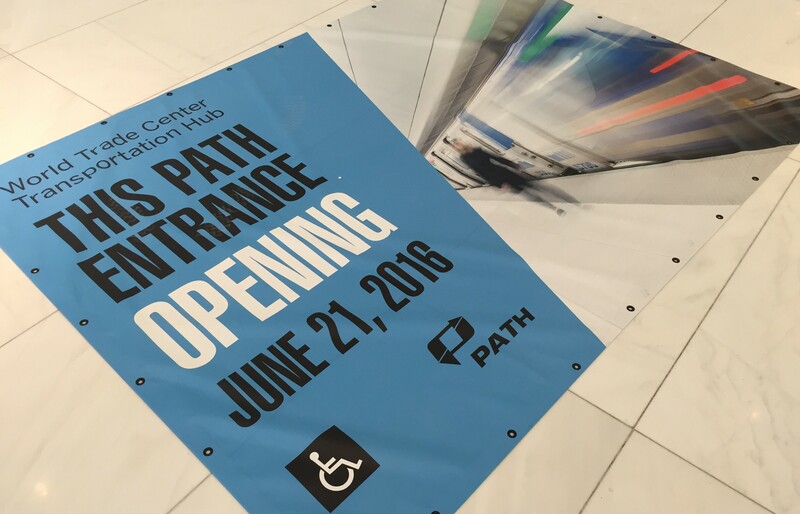 On May 26th, 2016, the Port Authority of New York and New Jersey held an event to mark the formal opening of the World Trade Center Transportation Hub, and the Dey Street connection to Fulton Center and the New York City Subway. 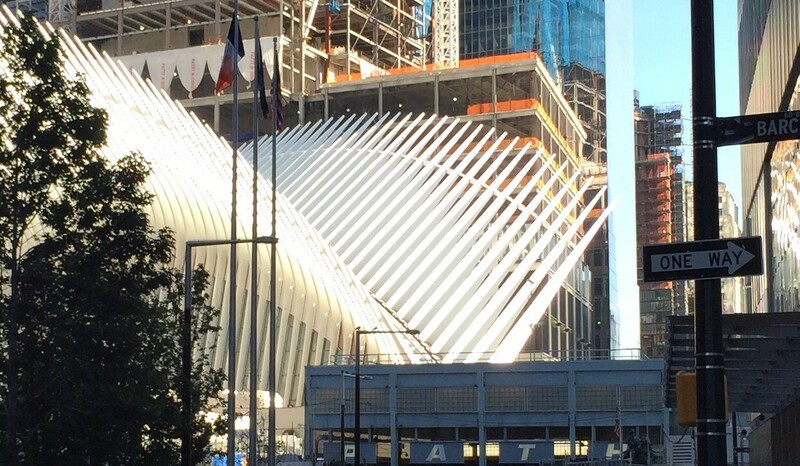 The WTC Transit Hub and Dey Street Connection between PATH and the New York City Subway are officially open! 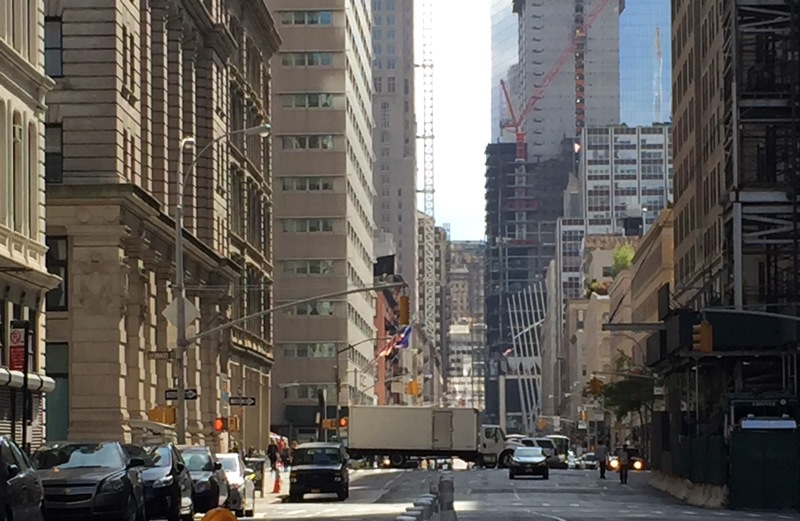 Construction workers put the finishing touches on Downtown Manhattan’s newest civic space. 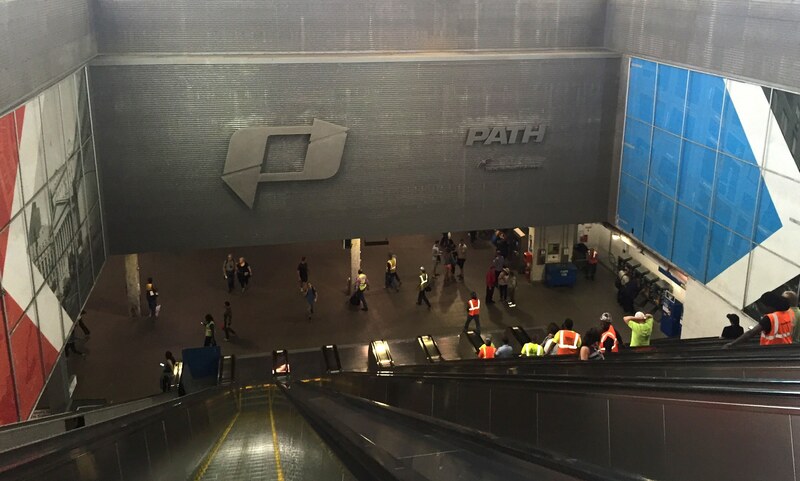 On June 21, 2016, the North Concourse opened, connecting Vesey Street with the WTC Transportation Hub. 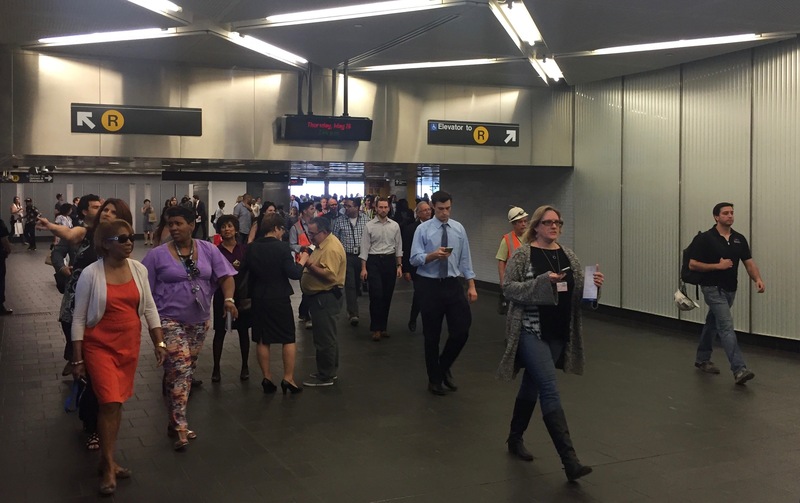 This opening is a milestone because it marked the last step before closure of the temporary PATH station entrance at the intersection of Vesey and Greenwich Streets. That entrance closed at midnight on Sunday, June 26, 2016. Downtown Manhattan from the Oculus floor. 1 WTC seen through the skylights atop the Oculus. 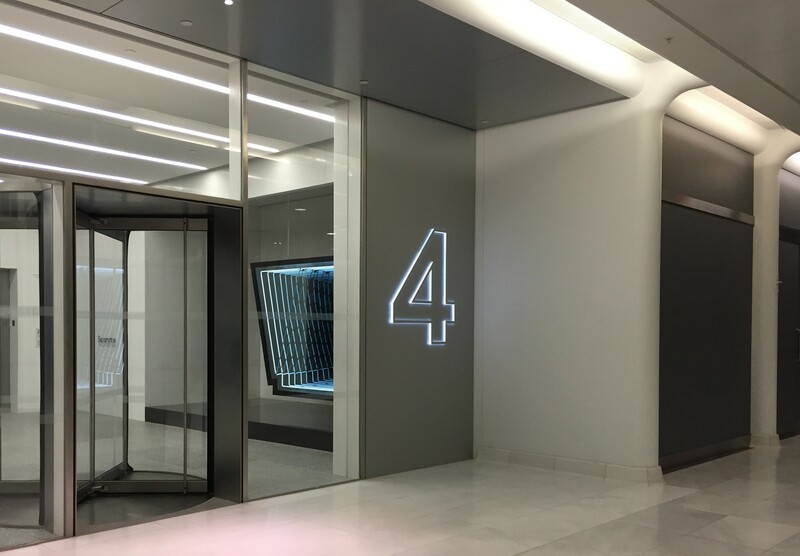 4 WTC entrance with a public art installation that appears infinitely deep. 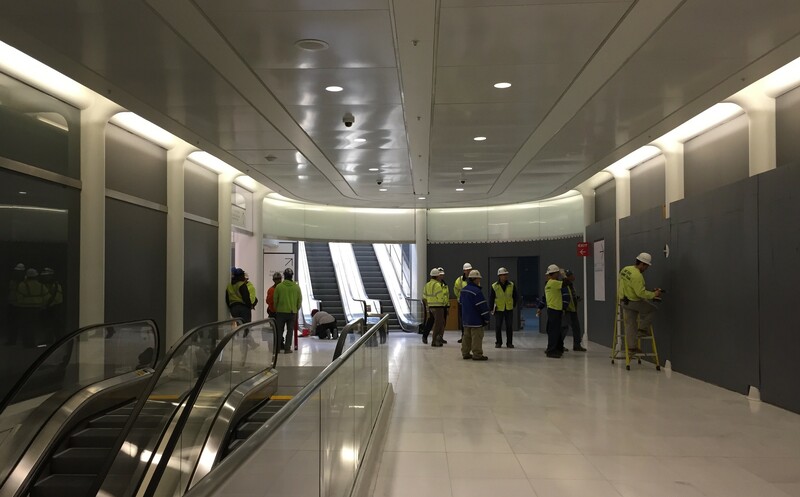 Inspections and finishing touches on the South Concourse and escalators to street level. 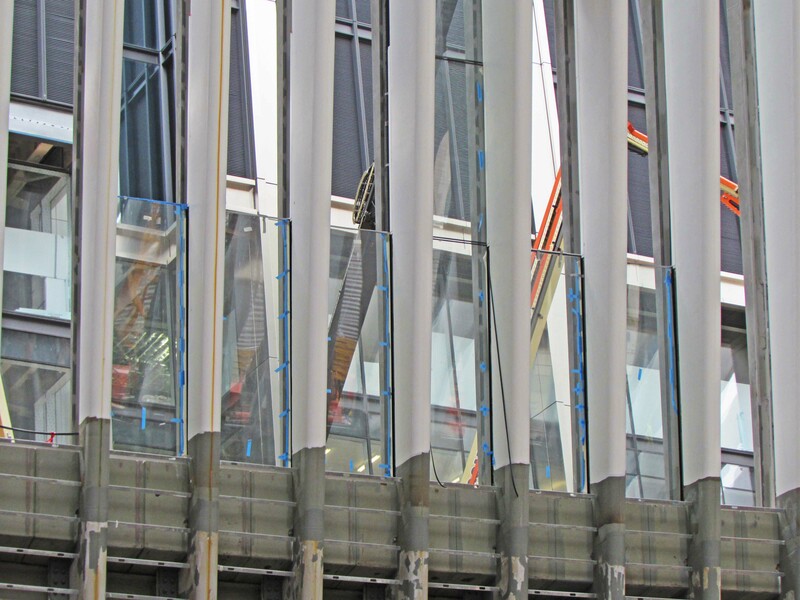 Looking up to street level from the Transportation Hub entrance at 4 WTC.